BeenThere-DoneThat: City of Hereford, Herefordshire. 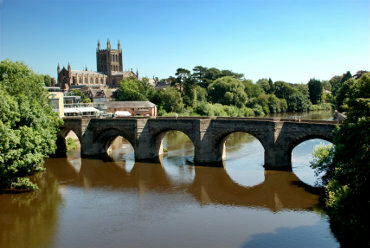 The Cathedral and Old Bridge, Hereford. 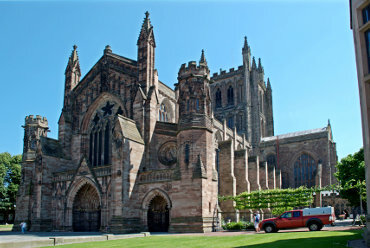 Hereford is a cathedral city on the River Wye and is the county town of Herefordshire. Seen from the new road bridge the old bridge, which replaced an earlier wooden bridge, dates from the early 12th century. You can see that this bridge is not very far from the cathedral. Built from red sandstone the present cathedral dates from the 11th century and this view is from the west. The total length of the cathedral is 342 feet with a nave 158 feet long and the tower is 140 feet high. 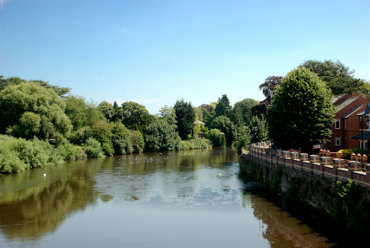 The River Wye is the UK's fifth longest river at 134 miles and for much of its length forms the border between England and Wales. The river passes through Rhayader, Builth Wells, Hay-on-Wye, Hereford (the only city on the River Wye), Ross-on-Wye, Symonds Yat, Monmouth and Tintern, finally meeting the Severn estuary just below Chepstow. 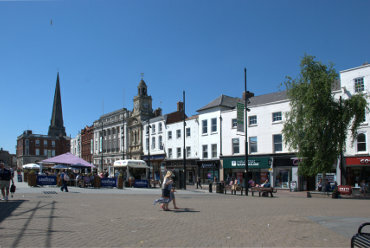 This used to be the old Market Place and is now the main shopping centre. Church Street, a narrow pedestrianised lane, connects this area with the cathedral. 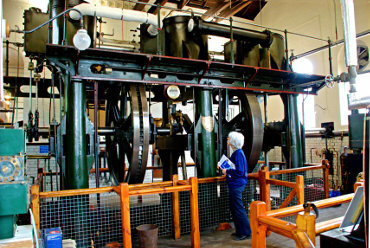 This museum is in the area of Hereford known as Broomy Hill and is housed in the old Hereford Waterworks. It traces the history of drinking water and there are numerous exhibits of which this Worth Mackenzie triple expansion steam engine is but one. Now that is a mega steam machine! It is definitely worth a visit and facilities inlude a small cafeteria and car parking but opening times are restricted so check on their website before you go.